This Youth's Companion article and illustration come from the January 5, 1865 edition of that newspaper. and up with the star!" 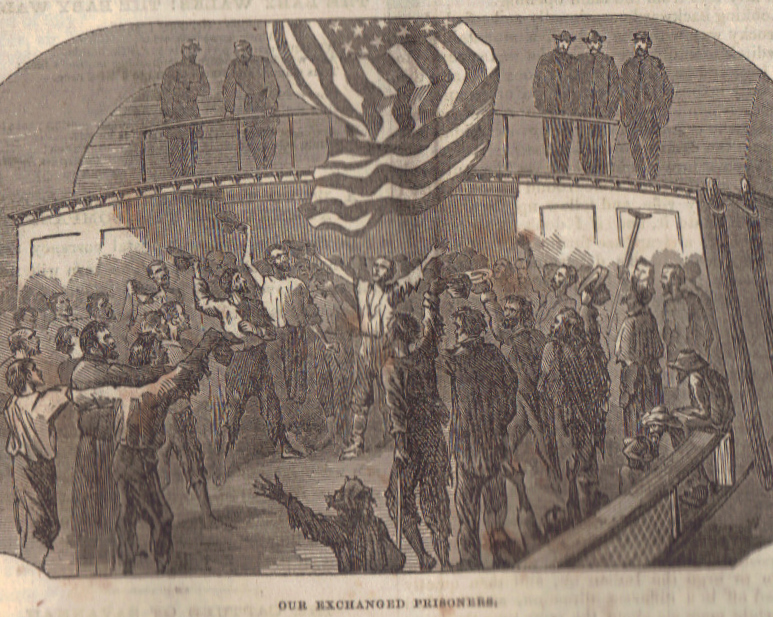 The condition of the released prisoners is thus described by a correspondent of the Philadelphia Inquirer: One poor fellow showed me his limbs. They were not larger toward the ankle than a man's thumb. It was touching as well as amusing to the bystanders to here their remarks as they came off the boat. One man, jumping up and stamping with this feet, uttered the exclamation as though it came from his very soul, "God bless the piece of land that I'm now on." Another: "Thank God I'm in His country once more." Others would utter like exclamations of joy and gratitude, such as, "O, what a blessed hour is this!" ; "Hurrah for the Union, I'm once more in it!" "Fourteen months in Dixie, but never a day more!" An Irishman, as he walked off, said, "Sure this is the happiest day since iver I came to Ameriky." 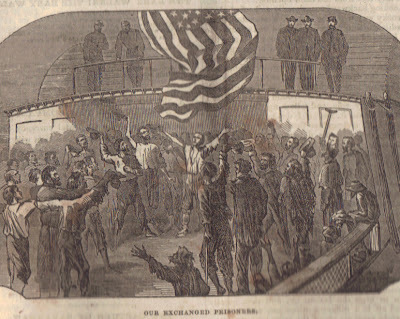 The information which these men give concerning their sufferings and the cruelty practiced toward them by the rebel authorities almost staggers belief. 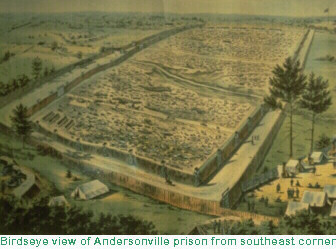 At Camp Sumter, which is the prisoner camp where they were confined at Andersonville, thirty odd thousand were held during the summer. Very few of these had any shelter from the rain or burning sun. Their only resort was to dig holes in the ground, and at each end excavate or scoop out the earth from under, so as to afford a partial shelter. Here two would creep for a little relief. Their food we need not describe. It is the same old story which we hear from every one who has ever been subject to the tender mercies of the authorities in the South. Their rations were seldom, if ever cooked. Peas and corn meal, or corn meal with an occasional bit of bacon, and in very small portions, were the only articles furnished them. The sufferings they endured can never be imagined. As I have gone around and sat by their beds in the different wards, and heard their statements of the conditions of the poor fellows who were at Camp Sumter, and at Andersonville, and Camp Lawton, at Millen, Ga., my very heart has ached, and I have had to leave that I might hear no more.